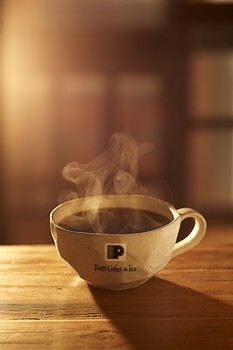 Peet’s Coffee and Tea has a promotion to celebrate National Coffee Day Sept. 29, 2015: all Peet’s across the country are offering a free small cup of Peet’s Major Dickason blend with any purchase of a baked good, Simply Oatmeal or fresh food item. Baked goods may include pastries, cakes, and cookies. In Northern California, the stores’ fresh food selections include cheese boxes, fruit bowls, and turkey sandwiches. To find the Peet’s Coffee & Tea near you, use the Peet’s online store locator. Major Dickason is the #1 coffee favorite at Peet’s, and one of my favorites too! A blend of coffees from the world’s premiere growing regions, it’s named after a regular customer at Peet’s original Berkeley store. Retired army officer Key Dickason brought the idea for this blend to company founder Alfred Peet in 1969. Peet worked diligently to refine it, and he and his team sampled countless combinations before arriving at what is now the company’s all-time bestseller.